Florence is situated in the Tuscany region of Italy, one of the most beatiful and charming places of Italy. Florence is an unbelievable attraction soaked of history, culture, art, museums and pleasant italian lifestyle. But Florence is especially a cultural experience! With a population around 400,000 inhabitants, Florence is one of the most important cities in Italy. Florence has a temperate continental climate. Summers are hot and dry with the average temperature in July and August at 35°C / 38°C . 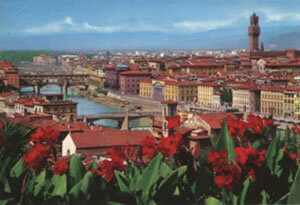 Spring is the most pleasant time of the year to visit Florence and his region. Florence having been home to the likes of Dante, Michelangelo, Leonardo Da Vinci, Machiavelli and among others, it has earned the title of ‘the Renaissance capital of the World’. Florence was city of the Medici Family, a powerful Florentine family from the Middle Ages till 17th century. One of the most important personage was Lorenzo De Medici called “il Magnifico”. The best attractions in Florence are Santa Maria del Fiore, popularly known as “Duomo” because of its huge wooden dome, is one of the largest cathedrals in Europe, the Baptistery of St. John with its intricate mosaic floors and the charming bell tower, the “Campanile”. The dome was built by Brunelleschi and the Campanile was designed in part by Giotto. The several piazzas are typical of Florence. The Piazza della Repubblica, the original medieval town centre, and the Piazza della Signoria, the location of several museums and galleries, are the most important ones. Near Piazza della Signoria is located on of the most popular museum in the world: the Uffizi Gallery (the offices). Other important attraction in the center of Florence is the Ponte Vecchio (Old Bridge): is a unique stone bridge with shops hanging on to its edge with the help of stilts. Florence and Tuscany are synonymous of landscapes, graceful hills and the calm of countryside. Florence is an ideal base to discover the rest of Tuscany, especially the wine region of Chianti and the wonderful belt of Siena and Pienza called Val d’Orcia: since 2004 added to the UNESCO list of World Heritage Sites.